Cabbage is a delicious and great natural source of phytonutrients and vitamins A, C and K. As a cruciferous vegetable, it’s also sky-high in glucosinolates, a specific type of phytonutrients which have proven anti-cancer and anti-inflammatory benefits. Cabbage is naturally low in calories and high in fiber – there’s nothing not to like! In a large mixing bowl, combine cabbages, Brussels sprouts, carrots, leek and daikon radish. Mix well and set aside. In a mixing bowl, combine vinegar, mayonnaise, mustard and tahini. Whisk together. Add salt and pepper to your personal taste. 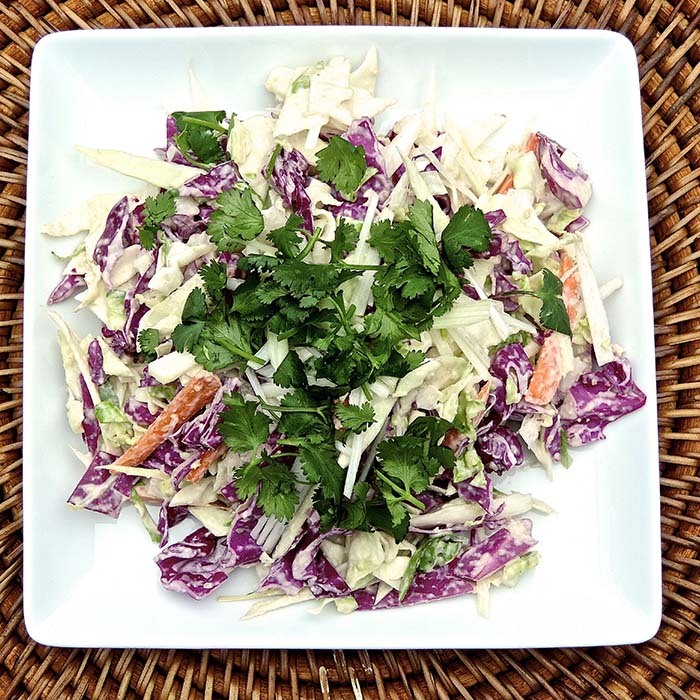 Pour over coleslaw salad and mix well. You can add or remove ingredients to your liking. Some suggestions are adding shaved fennel, zucchini, parsley and/or watercress. Top your slaw with sunflower seeds, pumpkin seeds, sesame seeds or your personal favorites - as always, feel free to get creative.